Sept. 28, 2017 (Lincolnshire, Ill.) – Klein Tools (ww.kleintools.com), for professionals since 1857, last night announced Jimmy Ferris as the winner of its annual Electrician of the Year award. As the 2017 grand prize winner, Ferris is able to choose his choice of a trip to one of four iconic American destinations: Charlotte, North Carolina; New York, New York; Las Vegas, Nevada; or Sturgis, South Dakota. He and a guest will experience the best the chosen destination has to offer. He will also receive a one-time order of $1,500 in premium-quality, professional-grade Klein Tools products. Ferris currently resides in Folsom, California, where he is a high-voltage substation electrician with the Sacramento Municipal Utility District, as well as a journeyman electrician and foreman. As a leader in the workplace, Ferris prioritizes safety with his crews and ensures everyone remains safe while on the job. Members of the Klein family, with help from a screening panel and thousands of fan votes, ultimately selected Ferris from hundreds of applicants for his outstanding professional achievement, dedication to safety and contributions to his local community. Part of what made him an outstanding candidate was that he already has been recognized by supervisors and peers for his leadership, commitment to safety and generosity on and off the job. Klein Tools also congratulates the 2017 Electrician of the Year runners-up: Brent Heesacker, Kevin Wick, Nathan Guerrero, Luis Gonzalez and Harold Melia. 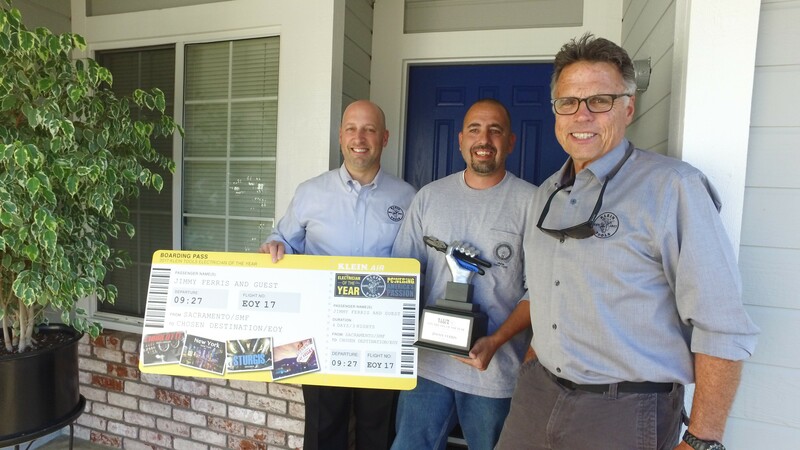 All finalists received the Ultimate Garage Package, which includes a 41-piece Journeyman Tool Set and other Klein Tools products, as well as a trip to tour Klein Tools’ manufacturing headquarters in Mansfield, Texas. More information on the Electrician of the Year award and all winners is available at www.kleintools.com/eoy.